I was in India for the past four weeks. Though I was browsing SharonB’s blog for the TAST challenge, I was not participating . this was a stitch free holiday for me. After returning back, I started with the 16th week stitch – French knots.I have not been using this stitch when I worked the other weeks stitches, thought this stitch could be part of the challenge. I can work on it during that week. At last it is here. 1.these three rows I tried familiarizing with the stitch. 2.the first row, after working the French knots, I worked chain stitches over them. The second row, the French knots are worked with herringbone stitch. 3. 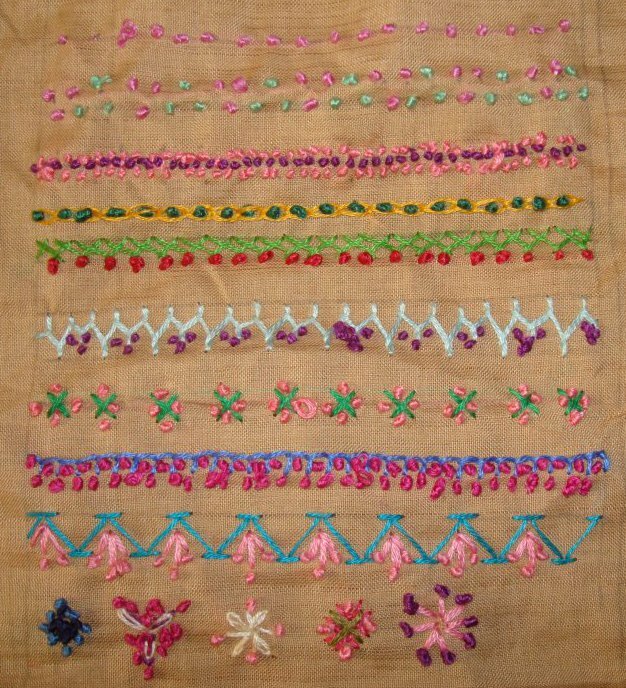 A variation of Cretan stitch with French knots. French knots are worked around cross stitches, to form a pattern. 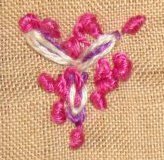 4- french knots are worked with buttonhole stitch. A row of chevron stitch, and French knots with straight stitches worked on one side. 5. French knots in two colours. 6.straight stitches , detached chain stitches and French knots. 7.another motif with straight stitches , detached chain stitches and French knots. 8-cross stitch, fly stitch and French knots. I liked this one the best. 9- straight stitches and French knots in circle.